samples collected in the Mediterran Sea, and South Atlantic, Pacific, and Indian Oceans. cite as: GEOMAR Helmholtz Centre for Ocean Research Kiel Core Repository: Archive of information about the GEOMAR geosample collection. NOAA National Centers for Environmental Information. doi:10.7289/V5J67DXV [date of access]. Open an ArcGIS interactive map interface with the GEOMAR sample layer active, to search and download data from the IMLGS database and access related links. Text interface to search and download data for GEOMAR samples from the IMLGS database and access related links. How to cite this data set (doi:10.7289/V5J67DXV), all access options, and complete documentation. Data Update Frequency Not planned - GEOMAR data were a one-time contribution to the IMLGS database. 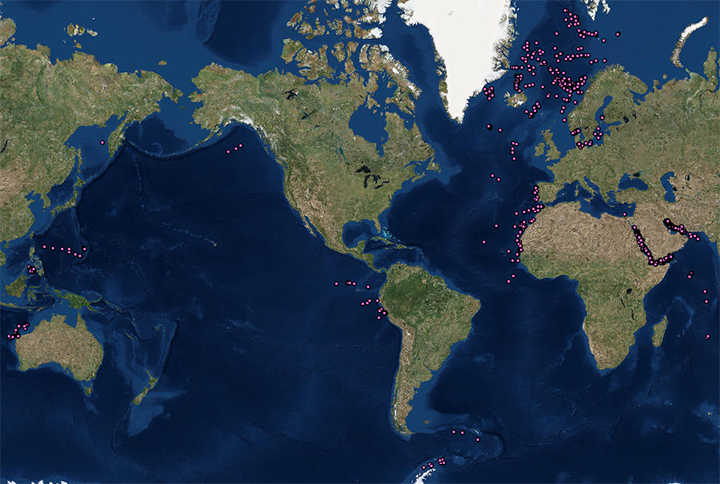 Only a portion of the GEOMAR sample collection is represented in the IMLGS. Additonal related data and information are available directly from the contributing institution, which is the authoritative and most current source of data and information related to their sample collection. The IMLGS contains a subset of summary metadata from selected historic samples in the institutional database. Purpose The purpose of adding information about the GEOMAR geological samples collection to the IMLGS was to promote new research on existing samples. More complete data about the GEOMAR sample collection is maintained by PANGAEA. Please consult the Curator before proposing to do research on any sample discovered through the IMLGS or the NCEI archive. Sample metadata are available online for free download. Other Constraints cite as: GEOMAR Helmholtz Centre for Ocean Research Kiel Core Repository: Archive of information about the GEOMAR geosample collection. NOAA National Centers for Environmental Information. doi:10.7289/V5J67DXV [date of access]. Lineage Statement Data were a one-time contribution from this repository. Incoming data were checked for adherence to controlled vocabularies, illegal data types in numeric fields, and out of range latitudes/longitudes. NCEI performed cursory visual inspection of data for reasonableness, asking the originator for guidance on discrepancies. Processing Environment Native Dataset Environment: database tables. Description of Source: Additional information about the samples may be contained in GEOMAR technical reports and/or publications.